Easy Pancit Luglug with thick noodles, flavorful gravy, ground pork, shrimp, chicharon, and eggs. It’s hearty, tasty and a classic Filipino favorite! Although a very simple recipe, this easy pancit luglug needed a bit more reading up and googling to put together than I expected. You see, in Kapampangan food culture, pancit palabok is called pancit luglug so I’ve always thought these two noodle dishes as one and the same and luglug, which means “to submerge” in Kapampangan, is just the Kapampangan term for palabok. 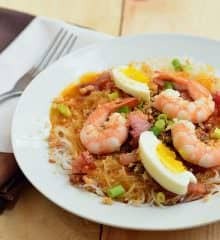 After going through a few online recipes, however, I found that pancit luglug is referred to in other parts of the country as the Kapampangan version of palabok but is said to be made of THICK, spaghetti-like noodles akin to pancit malabon. This was the confusing part for me because as I far as I know, Kapampangan luglug is exactly like palabok INCLUDING the use of THIN bihon noodles. I thought I was mistaken because when I went to Seafood City to buy my noodles, there were indeed these THICK noodles specifically labeled pancit luglug but when I went through the different packages on the shelves, I also saw thin versions of these noodles! I did a little bit more research and I believe I have my answer. Pancit luglug isn’t necessarily made with thick noodles but rather of a type of noodle made of cornstarch instead of rice flour. Either the thin or thick variety of these cornstarch noodles can be used with delicious results. While my pancit palabok is absolutely scrumptious, it does require a bit of work. As much as it’s a family favorite, it’s not something I’d willingly tackle outside of special occasions. This easy pancit luglug, on the other hand, is quick and simple for everyday meals yet fancy enough for company. Instead of a long list of toppings, ground pork takes the center stage for flavor. If you’re planning your holiday menu, add it to your list! It’s super tasty, economical to make and can be easily doubled or tripled to feed a crowd. I use annatto powder to easily add color to the gravy but if you want to use seeds, you can either steep them in hot water or briefly panfry in hot oil until desired depth of color is achieved and add the atsuete water or oil in making the gravy. Although both methods will work, I recommend extracting in water vs in oil to trim down the fat. I use shrimp bouillion to add flavor to the gravy but feel to make homemade shrimp stock using shrimp heads and peels. I suggest poaching the shrimps first before proceeding with the pork and gravy so you can use the liquid. I like to toss the gravy and the noodles together when I am using the thick kind. For thin noodles, just serve topped with the sauce and toppings as they are a bit more fragile and tend to get mush. Eggs are an important part of this noodle dish and nothing ruins a good hardboiled egg in my opinion than a gray ring around the yolk. For perfectly cooked and easy to peel eggs, place them in a saucepan and cool to cover by one inch. Bring the water to a full boil over medium heat and then turn off the heat, cover, and let the eggs sit for about 10 to 12 minutes. Drain under cold running water to cool completely and to stop from cooking further. Make sure to try this recipe. It’s great for family meals and merienda and perfect for special gatherings as well. Do you prefer thin or thick noodles? Let me know in the comments below! Easy Pancit Luglug with thick noodles, flavorful gravy, ground pork, shrimp, chicharon, and eggs. It's hearty, tasty and a classic Filipino favorite! In a saucepan over medium heat, bring 4 cups of the water to a boil. Using a fine-mesh sieve, plunge shrimps into the hot water and cook for about 1 to 2 minutes. Remove and allow to cool to touch. Slice lengthwise into halves. Reserve liquid. Add ground pork. Cook, breaking apart with the back of a spoon until lightly browned. Drain excess fat except for about 1 tablespoon. Add atsuete powder and stir until ground pork is evenly colored. Add reserved liquid and bring to a boil. Lower heat, cover, and simmer for about 6 to10 minutes or until meat is tender and cooked through. Add shrimp or pork bouillion and stir until dissolved. In a small bowl, combine the remaining 1/2 cup water and flour. Stir until well blended and smooth with no lumps. Gently add to the pot, whisking vigorously to prevent lumps. Continue to cook for about 3 to 5 minutes or until sauce is thickened. Season with salt to taste. Meanwhile, in a large pot over medium heat, bring about 4 quarts of water to a boil. Add noodles and cook according to package directions until tender but firm. Drain well. In a large bowl, combine cooked noodles, meat sauce, and 1/2 cup of the crushed chicharon. Gently toss to evenly distribute. Transfer to a serving platter. Garnish with the remaining 1/2 cup crushed chicharon, sliced boiled eggs, toasted garlic, and green onions. Serve hot with calamansi.